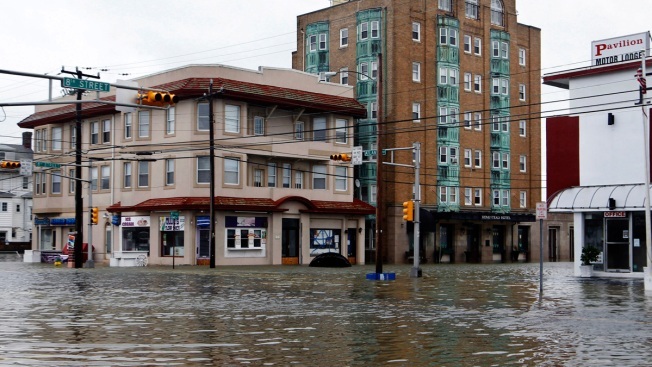 In this Oct. 30, 2012, file photo, the intersection of 8th Street and Atlantic Avenue is flooded in Ocean City, N.J., after the storm surge from Superstorm Sandy flooded much of the town. New satellite research shows that global warming is making seas rise at an ever-increasing rate. Scientists say melting ice sheets in Greenland and Antarctica is speeding up sea level rise so that by the year 2100 on average oceans will be two feet higher than today, probably even more. Melting ice sheets in Greenland and Antarctica are speeding up the already fast pace of sea level rise, new satellite research shows. At the current rate, the world's oceans on average will be at least 2 feet (61 centimeters) higher by the end of the century compared to today, according to researchers who published in Monday's Proceedings of the National Academies of Sciences. Sea level rise is caused by warming of the ocean and melting from glaciers and ice sheets. The research, based on 25 years of satellite data, shows that pace has quickened, mainly from the melting of massive ice sheets. It confirms scientists' computer simulations and is in line with predictions from the United Nations, which releases regular climate change reports. "It's a big deal" because the projected sea level rise is a conservative estimate and it is likely to be higher, said lead author Steve Nerem of the University of Colorado. Outside scientists said even small changes in sea levels can lead to flooding and erosion. "Any flooding concerns that coastal communities have for 2100 may occur over the next few decades," Oregon State University coastal flooding expert Katy Serafin said in an email. Of the 3 inches (7.5 centimeters) of sea level rise in the past quarter century, about 55 percent is from warmer water expanding, and the rest is from melting ice. But the process is accelerating, and more than three-quarters of that acceleration since 1993 is due to melting ice sheets in Greenland and Antarctica, the study shows. Like weather and climate, there are two factors in sea level rise: year-to-year small rises and falls that are caused by natural events and larger long-term rising trends that are linked to man-made climate change. Nerem's team removed the natural effects of the 1991 Mt. Pinatubo eruption that temporarily chilled Earth and the climate phenomena El Nino and La Nina, and found the accelerating trend. Sea level rise, more than temperature, is a better gauge of climate change in action, said Anny Cazenave, director of Earth science at the International Space Science Institute in France, who edited the study. Cazenave is one of the pioneers of space-based sea level research. Global sea levels were stable for about 3,000 years until the 20th century when they rose and then accelerated due to global warming caused by the burning of coal, oil and natural gas, said climate scientist Stefan Rahmstorf of the Potsdam Institute in Germany, who wasn't part of the study. Two feet of sea level rise by the end of the century "would have big effects on places like Miami and New Orleans, but I don't still view that as catastrophic" because those cities can survive — at great expense — that amount of rising seas under normal situations, Nerem said. But when a storm hits like 2012's Superstorm Sandy, sea level rise on top of storm surge can lead to record-setting damages, researchers said. Some scientists at the American Geophysical Union meeting last year said Antarctica may be melting faster than predicted by Monday's study. Greenland has caused three times more sea level rise than Antarctica so far, but ice melt on the southern continent is responsible for more of the acceleration. "Antarctica seems less stable than we thought a few years ago," Rutgers climate scientist Robert Kopp said. 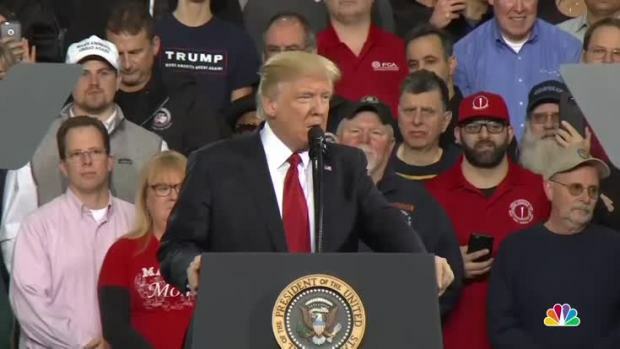 In a Wednesday afternoon appearance at the American Center for Mobility in Ypsilanti, Michigan, President Donald Trump promised to revisit federal regulations of fuel efficient cars and trucks set by the Obama Administration as part of their strategy to combat global warming. Trump also promised a "big announcement" in regards to the auto industry for next week.